There have been two brutal rideshare attacks in the Valley in one week, prompting some drivers to take their personal safety into their own hands. 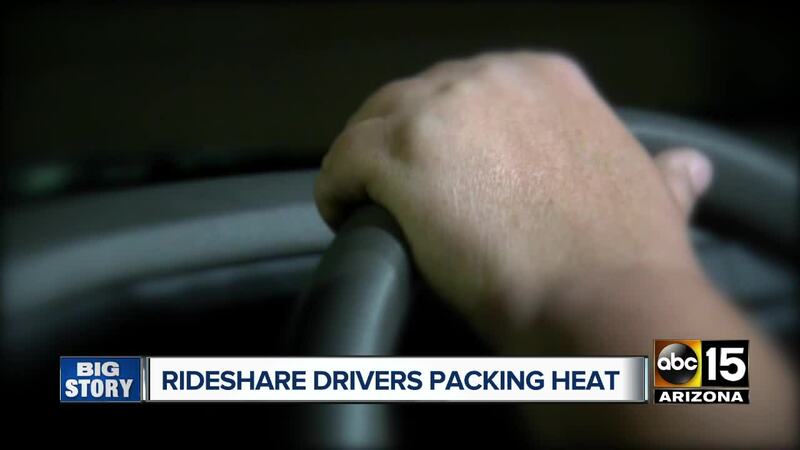 PHOENIX — There have been two brutal rideshare attacks in the Valley in one week, prompting some drivers to take their personal safety into their own hands. A pregnant mother and her unborn baby were murdered while the mother was driving for Lyft in Tempe . Days later, an Uber driver needed a dozen staples after getting his throat slit in Tolleson . The accused suspects, both passengers, have been arrested, but the fear for drivers remains. "I do think they need to put some more safety measures in for us," said one driver. As companies work to better protect their drivers , some of them are taking matters, and specifically guns, into their own hands. ABC15 concealed the woman's identity because she drives with a gun, and would be banned if discovered. "We're not allowed to carry firearms or knives," she said. The vast majority of rides go smoothly, and violence is rare, but this female driver said it is now about peace of mind. "Before I had never felt the need to worry about having [a gun], but now I am glad that I do." "Is it worth [the risk]?" Crenshaw asked. "This job isn't worth my life, so yes."